January 4th, 2018. Happy New Year. What a way to start a new year! A Blizzard...Everything gets thrown off track in a snowstorm. Will the roads be clear for travel? How will the job site be affected? What will this do to deadlines? Snowstorms bring uncertainties. One thing that it certainly does affect is the utility survey that you just had completed the day before. Maintaining marks from a survey can be a tedious task but a snowstorm really messes things up. Moments like these raise important questions. How can precious marks be preserved through conditions such as these? Using marking flags and/or stakes is the initial approach but it is not always the answer to situations like this. Marking flags and stakes can be moved or knocked over by the winds and snow of the storm or the process of snow removal itself. 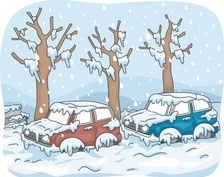 Even paint on the ground can be erased by the melting of snow and use of salt. One way to help to preserve the marks is to have the utility locate mapped accurately and dependably. Luckily, we do both! Utility Locating and Utility Mapping with GPS. 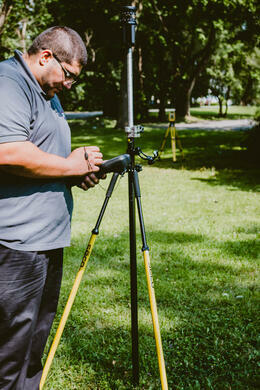 By using a survey grade GPS system like Trimble Geo 7x that we employ here at Utility Survey Corp., generating an accurate and dependable map of a utility survey is easy. By collecting GPS data of utility markings we can create a .KMZ file that can be opened over maps on Google Earth. It can even be used to create and/or update AutoCAD maps that can be used as reference when marks have been erased or lost. This mapping solution is a dependable alternative to rolling the dice on disruptive weather possibilities this time of the year, or at any time of the year for that matter. All too often we come across situations where we are contacted because no one has any knowledge or reference material regarding the location of utilities. We are always up to the challenge of finding pipes and cables... and we are really good at it; The World’s Greatest! Unfortunately, without mapping these utilities somewhere down the line, the same issue will present itself again. Utility mapping with GPS is a great way to preserve marks for future reference regardless of weather. 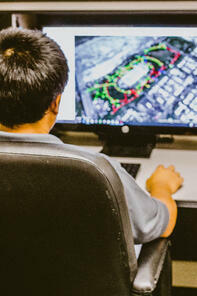 So next time you call for a quote, be sure to inquire about our Utility Mapping with GPS options. We can't wait to hear from you! In the meantime, download our proprietary "10-Step GPS Mapping Protocol"!